WASHINGTON (AP) — Directly contradicting President Donald Trump, U.S. intelligence agencies told Congress on Tuesday that North Korea is unlikely to dismantle its nuclear arsenal, that the Islamic State group remains a threat and that the Iran nuclear deal is working. The chiefs made no mention of a crisis at the U.S.-Mexican border for which Trump has considered declaring a national emergency. Their analysis stands in sharp contrast to Trump’s almost singular focus on security gaps at the border as the biggest threat facing the United States. 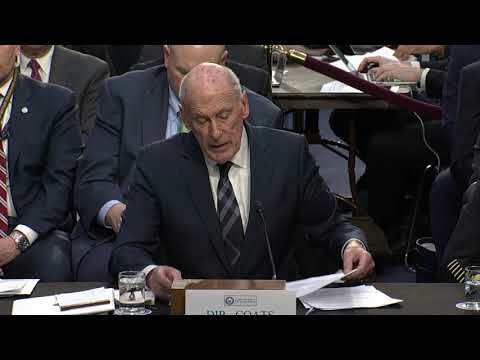 Top security officials including FBI Director Christopher Wray, CIA Director Gina Haspel and Director of National Intelligence Dan Coats presented an update to the Senate intelligence committee on Tuesday on their annual assessment of global threats. They warned of an increasingly diverse range of security dangers around the globe, from North Korean nuclear weapons to Chinese cyberespionage to Russian campaigns to undermine Western democracies. Coats said intelligence information does not support the idea that North Korean leader Kim Jong Un will eliminate his nuclear weapons and the capacity for building more — a notion that is the basis of the U.S. negotiating strategy. “We currently assess that North Korea will seek to retain its WMD (weapons of mass destruction) capabilities and is unlikely to completely give up its nuclear weapons and production capability because its leaders ultimately view nuclear weapons as critical to regime survival,” Coats told the committee. Coats did note that North Korean leader Kim Jong Un has expressed support for ridding the Korean Peninsula of nuclear weapons and over the past year has not test-fired a nuclear-capable missile or conducted a nuclear test. The “Worldwide Threat Assessment” report on which Coats based his testimony said U.S. intelligence continues to “observe activity inconsistent with” full nuclear disarmament by the North. “In addition, North Korea has for years underscored its commitment to nuclear arms, including through an order in 2018 to mass-produce weapons and an earlier law — and constitutional change — affirming the country’s nuclear status,” it said. The report said Kim’s support at his June 2018 Singapore summit with Trump for “complete denuclearization of the Korean peninsula” is a formulation linked to an end to American military deployments and exercises involving nuclear weapons. Trump asserted after the Singapore summit that North Korea no longer poses a nuclear threat. However, Coats and other intelligence officials made clear they see it differently. “The capabilities and threat that existed a year ago are still there,” said Lt. Gen. Robert Ashley, the director of the Defense Intelligence Agency. More broadly, the intelligence report on which Coats and the heads of other intelligence agencies based their testimony predicted that security threats to the United States and its allies this year will expand and diversify, driven in part by China and Russia. It says Moscow and Beijing are more aligned than at any other point since the mid-1950s and their global influence is rising even as U.S. relations with traditional allies are in flux. “Some U.S. allies and partners are seeking greater independence from Washington in response to their perception of changing U.S. policies on security and trade,” the report said, without providing examples or further explanation. The intelligence agencies said Iran continues to work with other parties to the nuclear deal it reached with the U.S. and other Western nations. In doing so, they said, it has at least temporarily lessened the nuclear threat. In May 2018, Trump withdrew the U.S. from that accord, which he called a terrible deal that would not stop Iran from going nuclear. The report specifically warned about Russia’s cyberattack capabilities. “Moscow is now staging cyberattack assets to allow it to disrupt or damage U.S. civilian and military infrastructure during a crisis,” it said.